One half of French and Farrar, me ... Steph ... is 5 days into an elimination diet called the Whole30. Two days ago, day 3, I was feeling strangely hungover and sluggish after wiping all traces of sugar, grains, dairy and alcohol from my system. My first thought upon waking up that day was, "what the hell am I doing?" and "I didn't drink last night, did I?" and "isn't this cleanse supposed to make me feel better?" 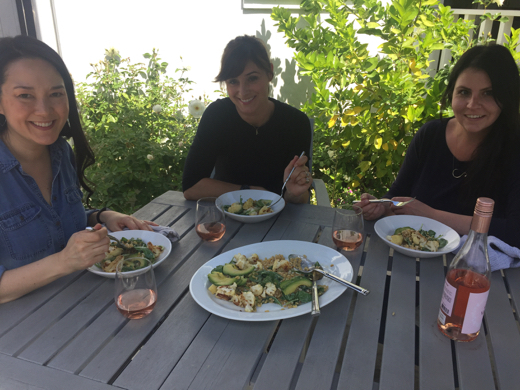 Then I channeled an incredible Sunday, two weeks ago, where I indulged in delicious, healthy whole grains, drank Rose' and played in the kitchen with friends. Only 25 more days to go, and until then, I'll reminisce. Sierra and I had the pleasure of hanging in my kitchen with the lovely Ann Taylor Pittman, executive editor of Cooking LightMagazine. She visited to cook a few recipes with us from her excellent, beautifully composed, and informative new cookbook Everyday Whole Grains. Ann, Sierra and I immediately jumped into getting to know each other while sharing knives and swapping stories. You can never really tell how well you might or might not get along with someone you've never met, but after mere minutes in the kitchen together, a friendship was born. Born over delicious, clean food. The first recipe is a simple Hot Buckwheat Cereal. In Ann's book she points to the savory option. We decided to throw in a sweet version, which makes for a great brunch bar, when adding fresh berries, honey and/or maple syrup. You could even add brown sugar and a little cream if you wanted to get crazy (that sounds so good to me right now). Flynn liked it too. He literally ate the entire bowl. Next we got really excited to stink up my house with the smell of roasted cauliflower. Tip: if you're ever having company, I suggest baking something like brownies or cookies... or even sautéing onions and garlic for that "wow, it smells so good in here" entrance. With the cauliflower, folks will enter to the sweet smell of dirty socks. Or feet. Or simply the smell of cauliflower. This is almost the exact moment I cracked open a bottle of Rioja Rose'. We didn't even need an icebreaker, but for an afternoon hanging in the kitchen, without the stress of serving anyone, Rose' was the perfect complement. The cauliflower is roasted, the berries are cooked and pat dry and now covered in a bit of tahini dressing. It all comes together beautifully. This is one of the easiest and tastiest salads I've ever eaten. One I will make often. Once I can eat damn grains again. So May it is! Thanks to sweet Ann for joining us in the kitchen and teaching us such yummy recipes. And to Zoe and Harry for helping out with photos and chasing Flynn around while we dined, dished and drank! Savory - Top cooked cereal with bacon, tomatoes, cheese, and jalapeños... add a pinch of salt and pepper if needed. Sweet - Top cooked cereal with berries and honey or syrup. Cook Kamut according to package directions. Drain and rinse with cold water. Drain again and spread evenly on paper towels to dry. While Kamut cooks, combine cauliflower florets and 1 tbsp of oil on a foil-lined jelly-roll pan coated with cooking spray. Toss well to coat. Roast at 475 degrees for 15 minutes or until browned and crisp-tender. Combine 1 tbsp oil, tahini, lemon juice, the warm water, 1/2 tsp salt, pepper, and garlic in a large bowl, stirring well with a whisk. Toss cauliflower with 1 tbsp of dressing. Add Kamut and arugula to bowl with remaining dressing, toss gently to coat. 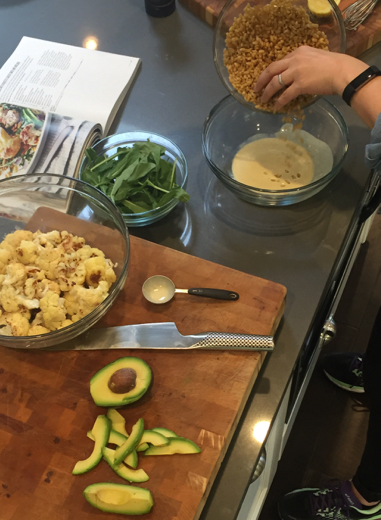 Arrange 1 cup of Kamut mixture onto each of 4 plates; divide cauliflower and avocado evenly over servings. Sprinkle avocado with 1/4 tsp salt.